Costume designer Bina Daigeler shares her inspiration for the film’s most memorable looks. Imagine what a zookeeper wears to work and sensible khakis, multi-pocketed vests, and rubber boots come to mind. But as the star of director Niki Caro’s new film, The Zookeeper’s Wife, Jessica Chastain doesn’t wear any of those things -- not even one pair of trousers. That’s because the real-life Antonina Żabińska didn't either. "Antonina's daughter, Teresa, told me that in her whole life she never saw her mother wearing pants. It wasn’t easy for me to understand that at first, but then I thought of it as a really beautiful statement," explains the actress of the hero she portrays. Antonina and her husband, Jan Żabiński (Johan Heldenbergh), were the Warsaw Zoo caretakers who saved hundreds of lives during World War II. "In this world of macho, violent aggression, Antonina was trying to bring softness and femininity and love to everything she did." To pull together the wardrobe for the film, which begins in 1939 just before the War and ends in 1945 after much hardship and devastation, Daigeler gathered vintage pieces and fabrics. In addition to the striking attire that Chastain and the other main characters wear, Daigeler and her team had to outfit hundreds of extras in the clothing of the era. "They were on set at two a.m. getting those people ready,” says Caro of one scene at a train station. "Every single person was dressed head-to-toe to in the period. No corners were cut in this department." While the costume work in the large crowd scenes is exemplary for its accuracy, the artistry shines through in the ensembles of the film's leading lady. 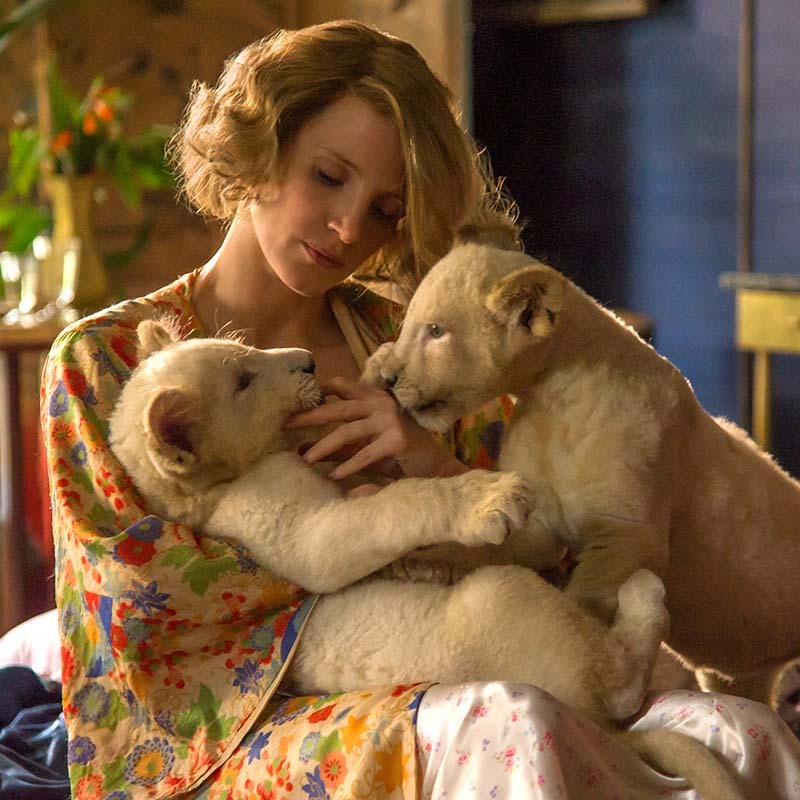 We asked Daigeler to explain her approach to a few key scenes in The Zookeeper's Wife. Throughout the film, we see Antonina working in the zoo wearing flowing skirts, blouses, and day dresses. Daigeler explains most were custom made for Jessica from original 1940s fabrics. "Because Jessica was always handling animals, she would get very dirty. She always had to have two or three copies of each dress," says Daigeler. "As I was researching vintage fabric, I found several flower patterns and they suited her very well." For this scene, early in the film, the Żabińskis host a cocktail party in their home at the zoo. Not only is it the first time she meets Lutz Heck (Daniel Brühl), a powerful Nazi officer who will control the zoo’s fate, but it also shows Antonina's immense range. She moves from charming guests to climbing into the elephant enclosure to save a newborn. Her clothes, a delicate blouse and a hip-hugging skirt, suggest a 1940s femme fatale look. "The real Antonina loved polka dots, and we wanted to introduce them,” says Daigeler. "I also wanted to show Jessica’s beautiful skin color and so this is why she has this neckline." Daigler recalls that when the time came to shoot the elephant scene, "it was freezing, freezing, freezing cold. But Jessica suffered through it without complaining. She had no problem running with her high heels and tight skirt." Dressed for a dinner party, and animal midwifery. When the Żabińskis travel into town to speak with Nazi officer Lutz Heck about the zoo’s future, Chastain leaps off the screen in this custom-made burgundy suit. "I wanted her to stick out next to Heck's uniform and Jan's grey suit,” says the costume designer about her color choices. "I wanted to give her a strong color that shows her determination." Near the end of the film, Antonina makes a second trip to Warsaw to speak with Heck in a desperate attempt to hold her family together. 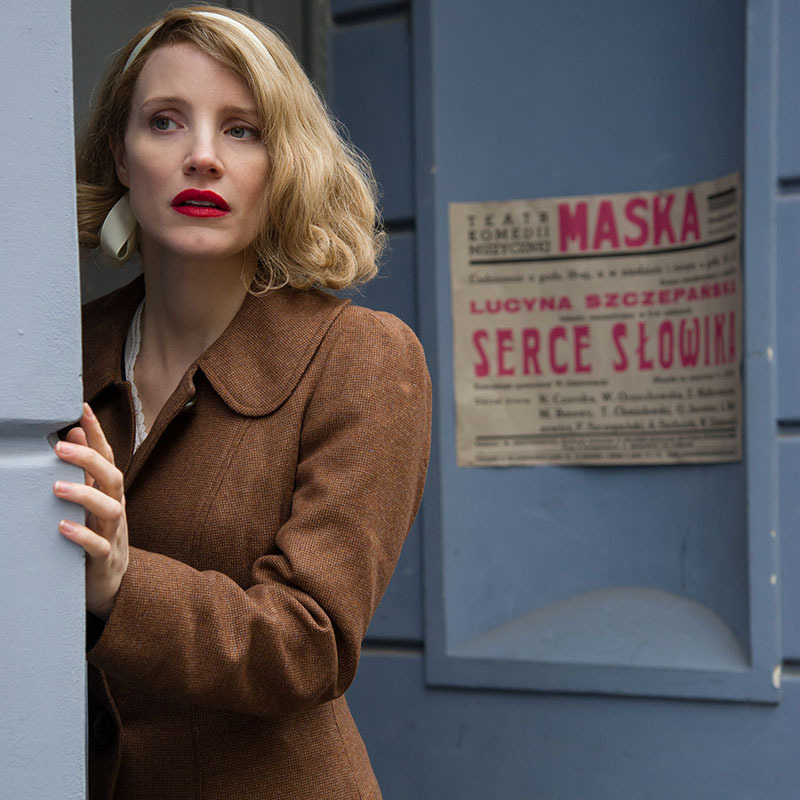 The actress wears a dark suit with a light blouse under a well-worn wool coat. In her hair is a single white ribbon, similar to the one worn in the earlier cocktail scene. "Her outfit is a mish-mash with this brown coat on top that looks a little weird, and her white hair band and red lips,” says Daigeler. "She is so scared because she has to go there, but this look is about her preparation to face that fear." The Zookeeper’s Wife is playing in theaters now. Find tickets near you.